Are we bitter? Hell, yeah. It’s like being dumped by your one true love for an unattractive gal who happens to have a trust fund. But if the Voice comes running back to Coney Island next season, we’ll overlook the bad choices they’ve made. In the meantime, Coney’s beer, hot dog and ride operators are going to miss the business on Siren Day. 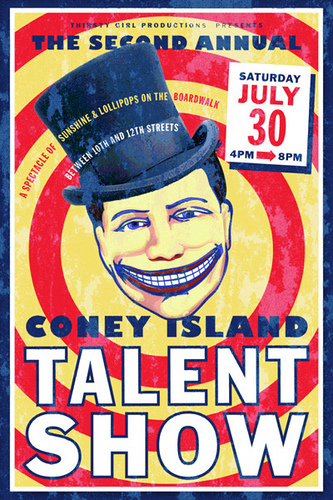 The good news is that the sirens of Coney Island have outlasted the Siren Festival and are putting on their own show. On Saturday at Cha Cha’s of Coney Island, the music begins at 8pm with Coney Island rock and rollers Neptune Jam, followed at 10 pm by the Girls! Girls! Girls! of the Hubba Hubba Hooplah Burlesque Revue. The presser says the July 16 show is “the last Burlesque Show at Cha Cha’s Club in Coney – this is our last summer of 2011 so come out & see the last burlesque revue on the boardwalk.” But the beat goes on through October with bands like All Mobbed Up and Windsor Terrors, and DJ Dance Parties on Friday nights during the fireworks. At the Coney Island Sideshow on Saturdays at 10 pm, there’s the Girlie Freakshow starring Insectavora, Serpentina, Kryssy Kocktail and guests–sirens one and all. Burlesque at the Beach has shows on Thursday and Friday nights all summer long featuring Bambi the Mermaid, Bunny Love and “Miss Coney Island”–past, present and future. Coney Island also has Jen Gapay, the siren who created and produced the first two Siren Festivals when she was Promotions Director for the Voice. Jen went on to launch Thirsty Girl Productions, which co-produces the New York Burlesque Festival with Angie Pontani aka Miss Cyclone. She has also produced events for Astroland, Deno’s Wonder Wheel Park and the Coney Island History Project. Her current Coney Island baby is the 2nd annual Coney Island Talent Show, set for July 30 on the Boardwalk. Hey you know what? If the Village Voice doesn’t come back to the beach and the boardwalk, Coney Island should launch its very own successor to the Siren Fest. Jen could do it again. All that’s needed are sponsors. Jen Gapay is the person to make a new Siren if the old Siren does not return. After reading about the downsized 4Knots, I kinda doubt the Voice will be coming back. Gotta get a whole new music festival for Coney! “Break a leg” with your new Burlesque blog! Maybe try some photos? on July 31, 2011 at 2:08 am | Reply Titus A. 4Knots had big problems. The older rock crowd didn’t dig the DJ club scene replacing a second stage, people were pissed that only Budweiser products were available, and most of the crowd of “several hundred” (as opposed to the Siren Fest’s “several thousand”) were too young to drink beer. Don’t be surprised if, as per a hint dropped in amNY, the Siren Festival returns to Coney Island with its three heads between its tail.